Sangeetha Kalanidhi Maharajapuram Santhanam (Tamil: மகாராஜபுரம் ஸந்தானம்), ( 1928 – 1992 ) was one of the great Carnatic music vocalists of the 20th century. He was born in Sirunangur, a village in the state of Tamil Nadu. He followed the footsteps of his father Maharajapuram Viswanatha Iyer who was also a Carnatic singer. Besides studying with his father, he was also a disciple of Melattur Sama Dikshitar. 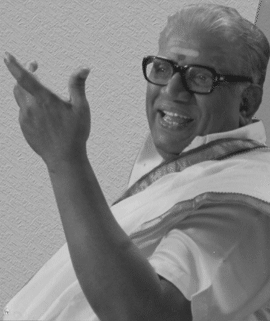 Maharajapuram Santhanam was also a distinguished composer. He wrote many songs on Lord Murugan and Kanchi Shankaracharya, His Holiness Sri Chandrasekarendra Saraswati Swamigal (Maha Periyavar). He was the Principal of Ramanathan College in Sri Lanka. Later he came and settled in Chennai. The most popular songs which were popularised by Maharajapuram Santhanam are “Unnai Allal” (Kalyani Raga), “Sadha Nin Padhame gathi, Varam onnru” (Shanmukhapriya), “Bho Shambo” (Revati), “Madhura Madhura” (Bagheshwari), “Srichakra Raja” (Ragamalika), “Nalinakaanthimathim” (Ragamalika), among others. The Maharajapuram Santhanam Day is celebrated on the 3rd of December every year. He died in a car accident in 1992. His sons Maharajapuram S. Srinivasan and Maharajapuram S. Ramachandran and his primary disciple Dr. R. Ganesh are now carrying on his musical tradition. His other most popular songs are PurandaradAsar krithis: “narayana ninna” and “Govinda ninna”. His rendition of “vilayada ithu nerama muruga” cannot be replicated by any other artiste. His voice is dipped in Bhakthi.